“Good evening Mr. Jenkins, would you like to see our drinks menu?”. I looked up at the waiter with an expression of pure amazement. I’d checked into the Four Seasons Amman twenty minutes earlier and decided to head to the bar for a night cap. How did he know my name? I was seriously impressed. Within minutes of entering the bar, I was sitting very comfortably, with a glass of the fruity St. George Chardonnay in my hand and bowls full of crisps, olives and dates on the table… and the staff addressed me by my name. The warm welcome I received was akin to a homecoming. And the hotel’s staff achieved that in a flash! I stayed at the Four Seasons Amman for two nights and I was continuously impressed by their service and the thoughtful details – in my book, the small touches that define luxury. I arrived late in the evening on the first day and was pleasantly surprised (and very thankful) to find a beautiful bowl of fruit and a food platter with olives, crisps and a variety of vegetable sticks and dipping sauces. I explored the rest of the spacious suite and noticed that the bed had already been turned down, with a bottle of mineral water at the bedside. The bathroom was equally spacious and the Bulgari toiletries didn’t look too shabby either. The next day, after a long journey to the north of Jordan and back, I returned to my room to find that the shirts I’d laid out on the bed earlier that morning had been pressed and hung up in the closet. Another small detail that caught my eye: the closet door was left slightly ajar with a sleeve poking out, I assume as an indication to me that my shirts had been moved from the bed into the closet. I turned my gaze to the writing table and noticed that my sunglasses had been polished and neatly laid next to its cover, atop a fresh polishing cloth. A very classy touch indeed! Needless to say, I had a wonderful stay at the Four Seasons Amman. The quality of service was top-notch: attentive, with a smile and lavished with details. What struck me was the clear intention behind every detail; each little action was meant to make the guest feel like everything was being taken care of. I didn’t have to repeat my preferences, such as how I like my coffee served: with soy milk on the side. That was how my coffee was served throughout my stay, after I’d made my preference known at breakfast (which, by the way, is a sumptuous feast!). Without a doubt, the Four Seasons is an excellent place to stay in Amman. Aside from the exceptional service, the luxurious rooms and the beautiful views of Amman, the hotel also houses two pools, a gym and a beautiful Spa that offers a great variety of treatments. 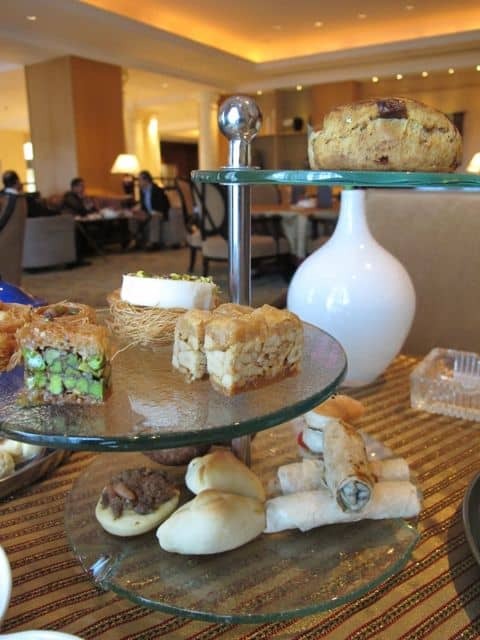 In the afternoons, you can indulge yourself with some sweet and savoury treats in the Foyer Lounge: the Four Seasons Afternoon Tea with an Arabesque Twist, with amongst others date and pistachio scones and cheese-filled kubbeh, is a pure delight! Afternoon tea with an Arabesque twist! When I entered my room that first evening, a message on the tv screen read “Welcome Home Mr. Jenkins”. The hotel’s staff did a brilliant job in making me feel at home; and as with any place we call home, it was hard to leave. Follow Four Seasons Amman on Twitter. Note: I was hosted by the Jordan Tourism Board and the Four Seasons Amman. All views expressed in this post are mine. Very nice! Ah, there is “nothing” better then exceptional service. Good for you Keith. Had to look up Amman to see where it was exactly. Looks like a Four Seasons to keep in the back pocket as a reminder to stay there. Those baklava-esque looking treats look AMAZING! Sounds like it was a spectacular stay! Oh wow – we’re going to be staying here next week and now you’ve made me even more excited! Everything sounds absolutely Divine!